During surface finishing of strip material, the color sensor system used must meet high requirements in terms of precision and speed. In order to detect color shades with an accuracy of ΔE <0.1, the colorCONTROL ACS7000 color measuring system from Micro-Epsilon is used. It is directly integrated in the production line and operates with high precision and speed. Classic strip material is used to produce punched, bent and deep-drawn components, filters and gaskets, electronic components and packaging components. The raw material, which in this case is steel or aluminum, is coated for refinement purposes and not only serves to enhance the appearance but also the resistance, while the material becomes easier to process. The company H.D.Lenzen specializes in the field of surface finishing for strip materials, while occupying a worldwide leading position in this market. The steel and aluminum strips are coated during surface finishing with zinc. Zinc is deposited onto the cleaned strip from an electrolyte solution by applying a high electrical current. The strip material not only receives corrosion and wear protection but also defined coloring. Reliable testing of this coloring is necessary in order to ensure consistent product quality. In order to fulfill the high requirements for precision and speed, the innovative colorCONTROL ACS7000 color measuring system from Micro-Epsilon is used, which recognizes color shades to an accuracy of ∆E < 0.1. Manual and visual inspections are not possible in this area as the trained human eye only recognizes color distances up to max. ∆E 0.5. In addition, the color measuring system must keep pace with fast inline measurements. Therefore, it is installed on a traversing unit that moves over the continuous material, which has a width of 720mm. Influences induced by fluctuating temperatures are minimized by continuous referencing. 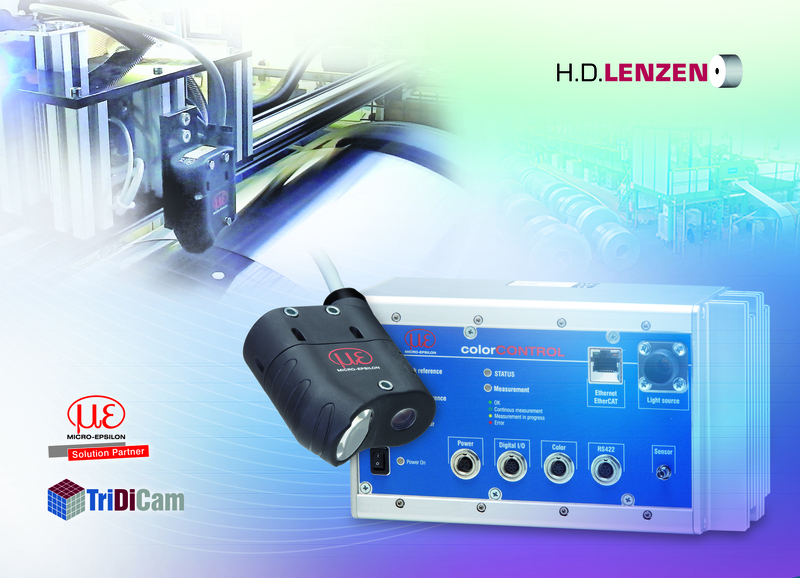 Via the Ethernet interface, these high precision measurement values are directly transmitted and evaluated to the connected production monitoring PC. Should deviations occur, the plant operator can rapidly intervene, which means waste is reduced. The core component of this 100% quality inspection system is the colorCONTROL ACS7000 color measuring system with the ACS1 sensor head from Micro-Epsilon. The plant integration, including the software for monitoring and retracing all past and current production parameters, was designed by TriDiCam GmbH who is an official system partner of Micro-Epsilon.